If you love Blackwing and Ravencry by Ed McDonald, then you'll be excited to know that he's coming back next year to give us more of The Raven's Mark series. 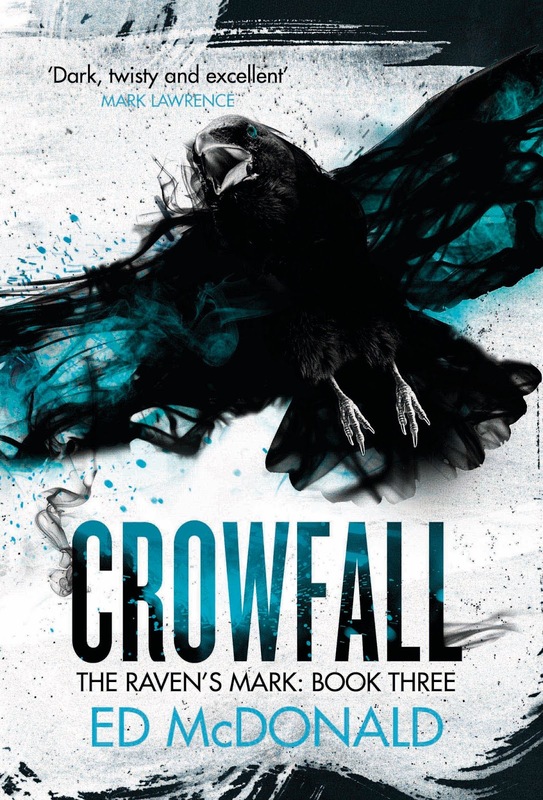 The third book in the series is titled Crowfall, following the title's theme of a "cawing" portmanteau. The cover has been unveiled recently courtesy of Dan Smith. On the flip side, it is sad to know that this will be the last book in said series. Hopefully it will be the best conclusion the story deserves. Are you ready for its coming? Check out the cover of the UK edition of Crowfall by Ed McDonald. Crowfall is a gritty epic fantasy for fans of Mark Lawrence, Scott Lynch and Daniel Polansky. A sorceress cataclysm has hit the Range, the final defensive line between the Republic and the immortal Deep Kings. Tormenting red rains sweep the land, new monstrosities feed on fear in the darkness, and the power of the Nameless, the gods who protect the Republic, lies broken. The Blackwing captains who serve them are being picked off one by one, and even immortals have learned what it means to die. Meanwhile the Deep Kings have only grown stronger, and are poised to deliver a blow that will finally end the war. Ryhalt Galharrow stands apart from it all. He has been deeper into the wasteland known as the Misery than ever before. It has grown within him - changed him - but all power comes with a price, and now the ghosts of his past, formerly confined to the Misery, walk with him everywhere. They will even follow him, and the few surviving Blackwing captains, on one final mission into the darkness. Crowfall by Ed McDonald will be released on June 13, 2019 in UK.